As I have posted elsewhere, Wow! So we have yet another protest to build toward October. A powerful message to the Coalition. A powerful message to the post-2015 government – whoever they may be. Hundreds of students and workers linked together to ensure Pride is a Protest! in Birmingham, on Saturday 2nd June 2012. The delegations from university and college student unions and trade unions politicised the parade with placards highlighting the disproportional impact of the cuts on LGBT people. Over 4000 leaflets were taken by protesters, LGBT organisations and community groups and the public. 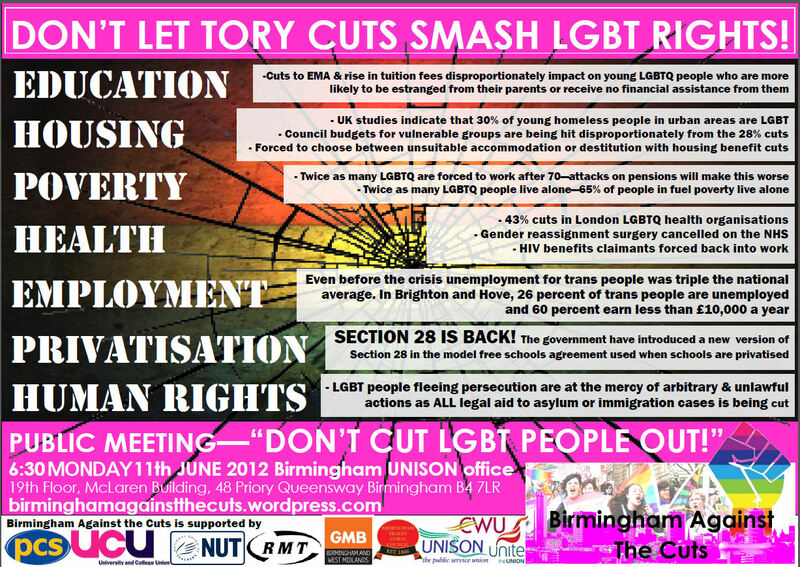 A public meeting will be held on Monday 11th June at 6:30pm in the Birmingham UNISON offices to continue the campaign. For more details click here.